Using tree care services will ensure your trees stay healthy and protect your family and property. Regardless of what happens, the trees in your landscape will continue to grow. Performing preventative tree care is almost always going to be more effective and less expensive than waiting until problems occur. You’ll want to address three key areas of tree care concern as you’re planning your landscaping budget for next year. Safety ought to be the key consideration when planning out your landscaping needs. For tree care, this involves more than simply removing dead trees and tree stumps. Structural defects in trees, especially trees near walkways, parking lots, and buildings, can be present that could result in tree failure. Broken and hanging branches need to be addressed and taken care of as well. Tree defects can not only compromise the safety of your property but can also affect your own personal safety. Oftentimes trees and shrubs are the most dominant part of a landscape. So when they don’t look good, the whole landscape looks bad with it. However, restoring aesthetic beauty to a tree or shrub doesn’t happen overnight. It takes careful planning and time to make sickened plants vibrant and healthy again. To ensure the health of your trees year-round, use part of your landscaping budget for on-going tree maintenance. This starts with a soil test to determine the composition of the soil and a remedial program is then designed to nurse the tree back to health. Every tree on your property has different needs depending on their particular age. It may be unrealistic to expect that every tree can receive the care it needs at the same time. 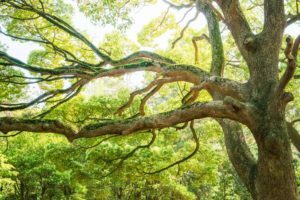 But by taking stock of the trees on a property, a comprehensive tree care plan can be drawn up to anticipate and plan for needs over the course of time. When property owners know what their trees require, they can make informed decisions on the tree care requirements of their trees while also taking any budgetary limitations into consideration. This entry was posted on Friday, October 14th, 2016 at 1:43 pm. Both comments and pings are currently closed.